Back of card: Looks like a violet ink wash. Inside the white border is a violet border, inside that are four crow-like birds, in flight. The top two face up, the bottom two face down. Not exactly symmetrical, but the differences, top & bottom, are minor, so the cards can be inverted. Booklet included: A folded sheet with sixteen panes. Each pane measures 2.6 x 4.7 inches, or 67 x 120 mm. Publisher: Lo Scarabeo. Printed in Italy, imported by Llewellyn. Comments: On the back of the box, it says, Once upon a time there was a tarot deck designed as if people had never grown up and all of the adults remained children forever. This is a typical tarot deck in most respects. 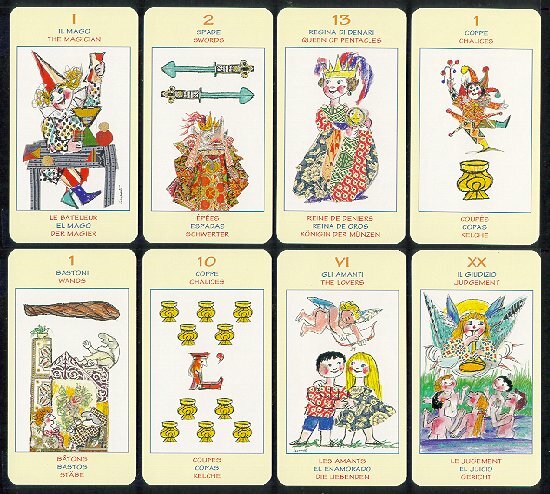 There are the usual four suits, the usual four face cards, the usual 22 major arcana cards. Major arcana are inspired by the Rider deck, minor arcana are Marseilles-type. Titles on the cards are printed in English, Italian, French, Spanish & German (in order, top to bottom). Despite the name, this is not particularly a deck for children. (There are few such decks & for the most part, I am not in favor of children using tarot. The exception is in Wicca households & you know who you are.) Whimsical illustrations are not quite the same as kid-friendly. (For that, see the African Tarot Deck, one of my favorites.) Shapes in the Children Tarot are generally simple, but details are often unclear. And it's going to be hard for most kids to get much out of the pip cards. Hard for most adults, too, I would imagine. Ace: Never take a joke too far. 2: The master of ceremonies. 4: The father of the bride. 5: Law & the policeman. 8: Friends do mischief with. These descriptions relate somewhat to the small images on the card. All in all, a fun deck.